Copper sinks reviews. Pros and Cons of copper sinks explained. Compare our copper sinks with others on the market. I guarantee there is no other copper sink on the market with as high a quality and as robust a guarantee as mine. Do you want to dry your copper sink after each use? No need to dry my sink - ever! Do you want to find that blemishes inside your sink are permanent? Can not happen with my sink. We are the only company that I am aware of that naturally ages the copper using household vinegar and a natural sponge for application. The Patina on my sink will always grow back and blend in - no matter what you do to the interior of the sink. Do you want to find out, after the fact, that Clorox or even hot coffee can permanently damage your sink? Clorox and any hot item will not harm my copper sink. Do whatever you want inside my copper sinks without worry! Do you want to find out after a year that you have no warranty on your sink? Our warranty is for life - period! Do you want to lean against the apron of your sink and dent it? I guarantee that will never happen with my sinks. Do you want to worry each time you use your sink? My copper sink is worry free. Use it, abuse it. You cannot hurt the interior of my copper sink without the copper regenerating a "matching color" patina and totally hiding any issue. Some of the largest companies selling copper sinks have a one year warranty! Are you kidding me??? A piece of metal with no moving parts should have a lifetime warranty. What are they afraid of? Could it be potential leaking? Permanent discoloration? Denting? Impurities in the metal? These are just some of the risks you take when you buy a copper sink based on price without doing research. Just read through our testimonial page. Our copper sink is simply the finest in the world. That is my personal promise to you. (My mother has always told me to only make promises one can keep) There is no other copper sink that remotely compares! Please watch the video below. Phone Access 7 days a week Come on, did you really think anyone else did this? Custom Patina Available Nothing like ours out there! Compare our sinks to the competition. Go ahead... just check the use and care and warranty for starters. Be alert - Do some intense research. The "Coppersinkbuyingguide.org masquerades as a Copper Sink Buying Guide. If you do a whois.com search you will find the same registration for that domain as Copper Sinks Online - who just happens to be the top pick of this site. This is what tipped me of to looking into the site further. This was taken from their site: "It seems like old news, but there are still retailers which like to use jargon that only confuses shoppers. Words like annealed and cold rolled are important to metallurgists, but they have little impact on the construction of copper sinks! These terms are used mainly to refer to the manufacturing process used to create the copper sheets rather than to sink making." I remembered seeing those exact words on Coppersinksonline.com. The fact is that there is a HUGE difference between annealed and cold rolled copper. Do the research yourself. You will find that cold rolled copper is about 8 times harder than the annealed copper virtually all other copper sink manufacturers use. They either are ignorant or they are intentionally giving false information. Cold rolled copper is very rare. In fact, there is only one vendor in the entire USA that offers cold rolled copper in sizes large enough to build a copper sink. I only point out facts that are either missing on other sites that would hamper an intelligent person to make a good buying choice or I point out information that is generally intentionally hidden on some sites. I would have no problem with another company putting up an informational website if the information was correct. As far as I can tell all imported copper sinks are made of recycled annealed copper - from melted down telephone wire and old pipes from demolished homes. IAPMO certification only requires a copper sink to have only 58% copper. I know of no import that has indicated they purify the copper through electrolytic methods. That is the only way to rid lead, copper and arsenic from copper. That process is so expensive that it is nearly the cost of refining virgin copper. I found a great video online of a company that makes copper furniture. It shows how copper scrap is made into copper sheets. I do not see any indication that the copper is purified at all! Check out the video. Some imported copper sinks show lead content of less than .01% - meaning, there is some lead in the copper. I do not mention this to alarm. Just pointing out facts. For example, a 1978 law in the US restricted the lead in paint for residences, furniture, and toys to 0.06% or less. I use only Cold Rolled 99.9% pure virgin Copper 14 gauge (much harder than annealed copper) Our copper has an RB hardness of 50. The yield strength is 63,600 pounds per square inch compared to 7,900 psi of annealed copper (generally used by the imports). Yield strength is an indication of a .2% movement under stress. As you can see, our sinks are significantly stronger. Don't be fooled by the other 14 gauge sinks out there. They are likely using recycled annealed copper which is significantly softer than ours. Our copper has an ASTM code of B370, which is 99.9% purity. We use a 122 alloy that is the highest grade of copper available for cold forming and welding. For those of you who are detail oriented, here is a link that shows all of the specifications of 122 copper. Make sure you look at the "Cold Drawn" section of the 122 copper. As you can see, the folks at Coppersinkbuyingguide.org and the folks at Copper Sinks Online are misleading the public in my opinion. There clearly is a difference in how the copper is treated! Our material is also RoHS compliant. RoHS restricts the use of mercury, lead, hexavalent chromium, cadmium and a range of other hazardous materials. Ask if "they" use cold rolled hard copper! Over 99% of all copper sinks you see online are made in Mexico, Turkey, India and China. Some websites give the "impression" of being an American company, so we suggest you ask where the sinks are actually manufactured. Made in Apopka, Florida Our sinks are made of pure 99.9% virgin cold rolled American copper. We never use recycled copper, nor do we use annealed (soft) copper. Not only are you supporting our U.S. economy, but you are purchasing a sink that looks distinctively different than any import. Import workmanship is no match for American craftsmanship! Most importantly, NO other company makes a thoughtfully designed sink. I hate to brag, but the other guys are missing the boat. Rear corner drains just make sense. Our Signature Series is unparalleled in the industry. There are some copycats, but their designs are greatly flawed. All other sink manufacturers require the cabinet to be at least 3" larger than the sink. My sinks are specifically designed to fit in the same size cabinet as the sink. The benefit is that you don't waste unnecessary space on your sink cabinet. For example, both my under mount and apron front 36" sinks are designed to fit in a 36" cabinet. No other sink manufacturer offers that! Also, my sinks are about the only ones that allow you to put a full height pullout trash mechanism behind the left door of your sink cabinet. That saves you money, space and is convenient!
" Due to the handcrafted nature of this product, Dimensions may vary up to 1/2". We strongly recommend that you wait for the actual product before making any installation cuts. Comments like that make my head explode. How gullible are we? When did a 1/2" tolerance become the sign of hand crafted products? When you order a 36" sink from us, it measures 36" - not 36 1/2" or 35 1/2". Most companies do not even have their specifications noted on their websites. Our 33" sink has 31" of usable interior space. The imports have significantly smaller bowls! Every inch of space in a sink is valuable. So why give up almost 10% of your space? We only need a 1" flange for strength. (Technically, we only need a 1/2" flange) Most of our competitors have 2 to 2 1/2" flanges. You are likely buying through a dealer, who purchases through a middleman, who purchases from a company over seas. Hmmm, this Mexican import sells for about the same as our made in the USA sink while the average worker is making $8.00 a DAY! Makes you wonder where all the money is going! You buy our products at true factory direct pricing (Direct to the public). From 1999 to 2008 Rachiele products could only be purchased through Authorized Dealers (at double wholesale). You could not purchase direct from Rachiele. In 2008, we terminated all 165 Authorized Dealers so I could give the customer service that I felt appropriate with such a high quality product. We are offering you the same wholesale prices we offered our displaying dealers. They used to double their cost to sell retail. Now you can buy at their cost! (Half of retail) We now sell only direct to consumers. It's kind of like buying a Rolls Royce at a BMW price. Still expensive, but quite the bargain! We have been competing with the Mexican, Indian and Chinese copper sinks for years now. All of them pay their workers less per day than my workers make in an hour. For example, the average wage in Mexico for this type of work is approximately $12 per day. They use recycled copper (often found in junk yards and from stripping wire). Often there is minimal or no cost of material. For example, I have been told that one of the largest copper sink manufacturers in Mexico is using discarded telephone wire to make their sinks. Mexico is changing to fiber optics and is removing tons of copper wire. Most imported sinks are marked up between 500 and 1000 percent before they are sold. We work on a 10% margin. 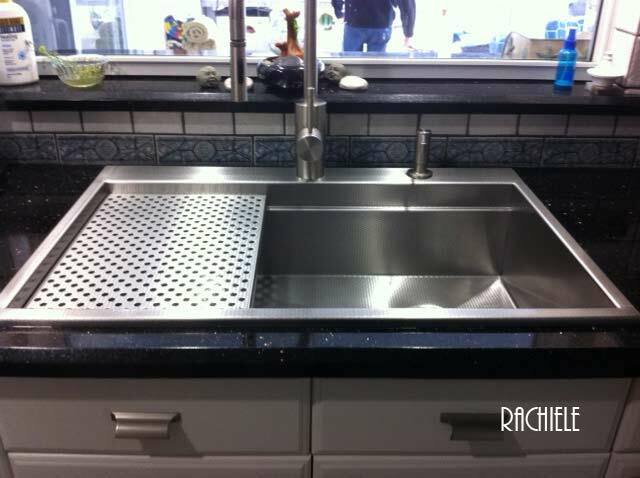 When you invest in a Rachiele sink, you are investing in real value - not profit! Generally middle or rear center - right in the way of your workspace. This is the most obsolete idea in sink manufacturing. What are they thinking? The offset drain is the most important value in our sinks! Rear corner drains - more uninterrupted work space in your sink. Also gives you significant room in your sink cabinet. If you have a center or rear center drain you cannot place a cookie sheet, etc, in the bottom of the sink without covering the drain. There is no logical reason for a center or rear center drain. Our right rear drain allows you to use our single bowl sinks like a double bowl sink. Simply wash on the right, set off to drain on the left. You cannot do that in a sink with a center or rear center drain. Try fitting a cookie sheet inside your sink. Does it fit without covering the drain? Do you have to rinse your platters while hovering over two bowls? I think that is so unnecessary. Some are quite poor. We receive countless calls from customers who have purchased "other brand" copper sinks with pooling water issues. They ask us what can be done. There is NO solution. Make sure your sink will drain BEFORE you install it. Many imported sinks do not drain properly. Comments like "waxing will help speed draining" should be red flags. This is exactly why the imports tell you that you must dry your sink after every use! We guarantee that your sink will drain properly. Just check our warranty. Ask others to do that and put it in writing. That is the second most common complaint regarding copper sinks. It is simple to build a copper sink with a flat bottom. It is somewhat easy to build one where the bottom slopes to the drain. It is very difficult to build a copper sink where all bottom portions drain to a rear corner. We do it and guarantee the sink will drain properly. If the company does not specifically warranty proper drainage you are relegated to drying your sink after each use. Well I warned you! 1 1/2" Our apron is thinner for a reason. We do not want you to have to reach over a large barrier of copper or stainless barring to access your sink. The main purpose of an apron front sink is that it eliminates the counter top in front of the sink so you don't have to reach to work in the sink. Must be deep to compensate for ridiculous drain location. Can not place anything of size inside the sink without covering up the drain so you really do need a deep sink with their drain locations. Generally 8" We believe a 10" deep sink is far too deep for our ergonomic sinks. Sinks with drains located in the center or rear center should be deeper than ours. With a center drain you have to put half of the large item in the bowl, wash that part, spin it around, wash the other part, then do the same spinning routine for rinsing. Wouldn't it make more sense to just make a sink with a rear corner drain so you can place large items inside without covering up the drain? No more spinning! (I'm getting dizzy) When you work at the bottom of the sink all the time, it should be shallower. I promise; with a good faucet, no worries with splashing and large pots! Lots of mention regarding what you should not use inside the sink (lemons, bleach, abrasives). Most suggest wiping the sink dry after each use. Also regular waxing of the sink is often mentioned. My car requires less maintenance! At least I don't have to dry it every time it rains. This is the number one complaint I hear about "other" copper sinks. NO disclaimers! No gimmicks! Just use the sink as a sink. This is one of the major differences between our sinks and others. There is no lacquer inside our sinks, no artificial coloration. 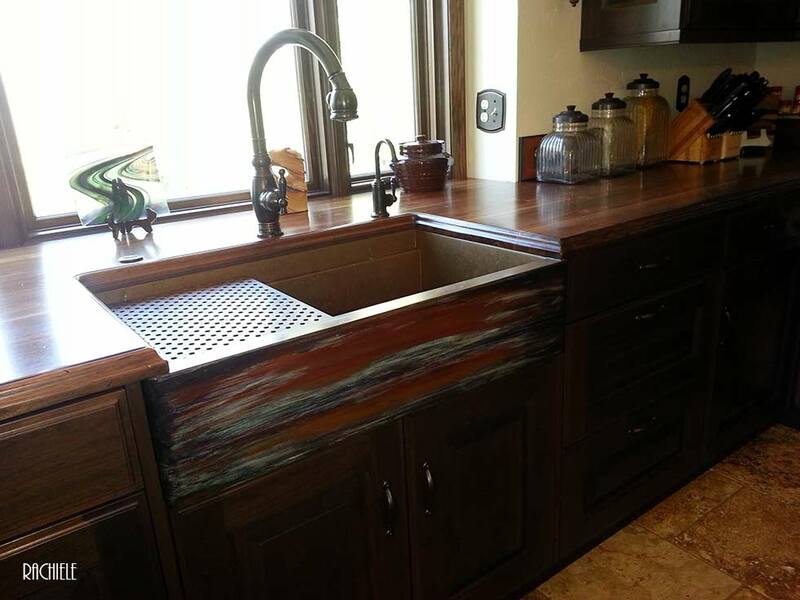 Our sinks are naturally aged using only household vinegar and will always return to that coloration. The interior of a copper sink should be the color of an old penny. Any other color will be a problem. Bleach, lemons, abrasives are just fine in our sinks. Our use and care suggests cleaning the sink with the same soap used to wash your dishes. That is all you do! NO DRYING after each use, NO WAXING. It's bad enough that we have to wax our cars! Just read this unsolicited email: "I love your sinks because they are EASY to take care of (yes- I am lazy). I used to have a stainless steel sink in my kitchen and the smudge marks used to drive me crazy. I really don't do much to keep my sinks looking beautiful now- I simply rinse them out with soap and water while washing my dishes. Nothing else!!!!" Warranty information is usually well hidden on many web sites - for good reason. Bottom line... after a year, it is your problem! Lifetime "transferable" warranty - not just to the original owner. That means when you sell your home, my sink is under warranty. Can't say that about any other copper sink! My warranty specifically covers proper sink drainage. The only part of my sink that cannot have a warranty is the lacquered apron. We do warrant that the lacquer is not defective. That being said, any lacquer or finish can scratch or chip. Your car finish or furniture finish can scratch or chip on day one and it would not be under warranty. That being said, this is a very rare occurrence and we have successfully been able to walk customers through a very acceptable repair process. How does a manufacturer put a limit on length of warranty on an item with no moving parts? If something goes wrong with a Rachiele sink, it should never be the problem of the customer (unless there is abuse). By the way, we have never had a warranty claim. If we did, my mom would be so disappointed in me. Don't accept what I say blindly. Do your research! Find other sources to prove or disprove what you see on our site. We are not afraid to be compared. You might ask why there is so much information on our site and why I don't just offer the merits of our sinks instead of comparing them with others. The reason is simple. Most copper sink web sites do not offer any important information so you can make an intelligent decision. Many bury the warranty and use and care information. Many make claims regarding IAPMO certification without explaining that the IAPMO requires only 58% copper in a copper sink. In order to find that information out, a consumer must pay $69.95 to read the 3 page document. I paid for the document in order to ascertain what exactly IAPMO tested. Since some companies are not disclosing ALL of the facts, I feel it important to do so because I believe when all the facts are laid out, our sinks are clearly superior in every way. If anyone finds any bit of misinformation on my site, please make me aware of it. I will gladly rectify. Almost always an applied and unnatural coloration. Some are waxed and most from China are lacquered (on the inside of the bowl) That is a "no-no". Very difficult to care for. This is why they tell you you cannot use certain products inside the sink that might be abrasive and that you should wax the sink regularly. When you disturb their finish, it will never go back to the original "unnatural" coloration. Most require drying after each use. Why? their sinks rarely drain properly and they pool water in the same areas all the time. This causes unsightly marks in a copper sink. Seriously...dry your sink after each use? Are you kidding me? Pooling water in my sink would be just as bad. My sinks are guaranteed to drain properly, hence there is no need to dry my sink after each use! The interior of our copper sinks is a natural patina (self healing) using only vinegar and water to achieve. This is how we can say our sinks are indestructible. Copper always wants to regenerate a natural brown patina. Disturb our patina and it will come right back naturally. Use abrasives if you must. 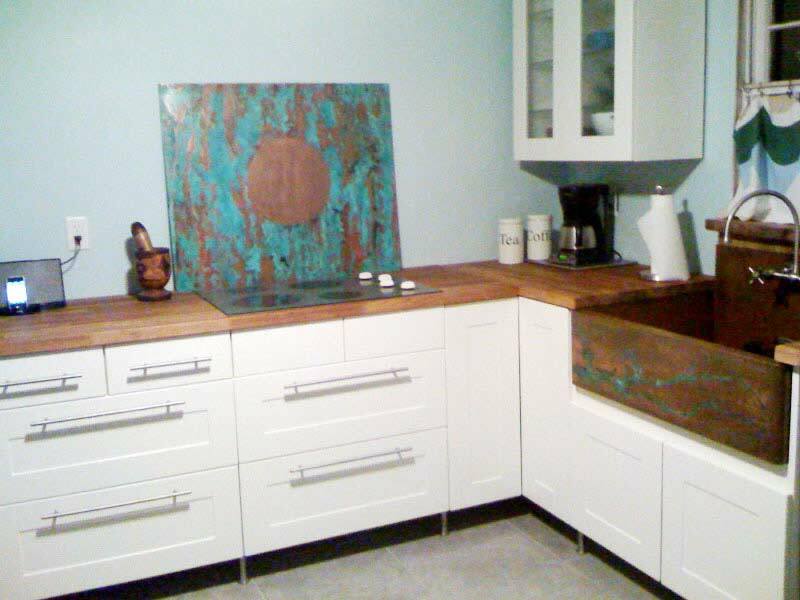 The patina will come back as you use the sink. Requires only washing with any dish soap. No other maintenance at all. No drying after each use, no waxing and no worry about what you can put in the sink. Just use our sink like a sink. How novel is that? Hmmm - Mama Mia! Try and find contact information on most of the sites. I have found that web sites that have easy to find contact information are generally doing that for a reason. They want to offer good and fast customer service. The ones that hide their contact information do so for a reason as well. Take a guess why? Not going to happen, sorry! Yes, due to rear corner drain and shallower sink you can have a double trash pull-out in your sink cabinet where it is most useful. I own the patent on the design. No other company can offer this solution. Simple installation. 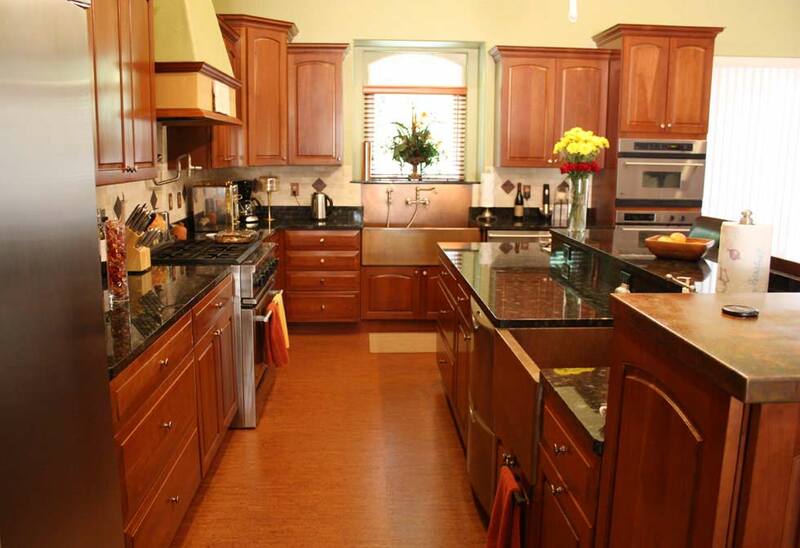 Just remove the false drawer heads and our apron slips over the face frame of the cabinetry. This can be done as a top mount or under mount sink in stainless or copper. Sadly, a couple of companies have stolen my patented idea (their design is lacking in many ways). Gives a more custom look, more usable space inside the sink and just as easy to clean. All of the high end sinks have zero radius interiors. 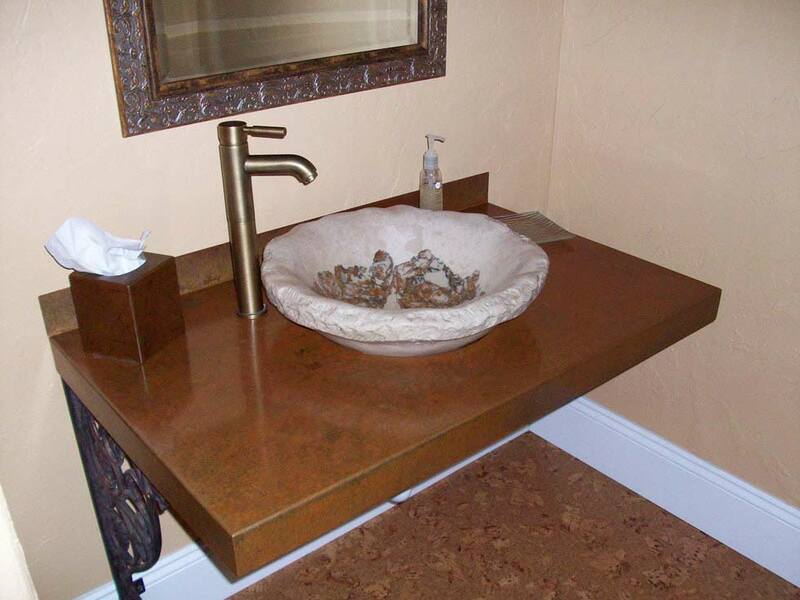 Our copper sinks have slight radius in all corners. Our stainless sinks are a true square corner on vertical corners and the transition from bottom to side is a slight radius. If you purchase someone else's sink, ask for a solid copper drain. I guarantee you will regret it if you don't. 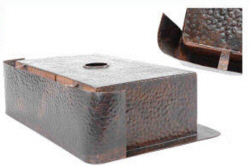 We have solid copper drains and disposal flange assemblies made for us. Trust me on this one, plated drains will fail. The plating will eventually come off. That cannot happen with our product. It is impossible to hand hammer cold rolled copper to look like the imports. Our material is too hard. We will hand hammer our sinks, but the look is truly hand hammered and does not resemble the hammering of the imports on the soft copper they use. Our hammering is in keeping with the quality of our sinks. There is no mistaking our hammered sink for a machined hammering. If we hammer the bottom of a sink, we do so with extreme care. Improper hammering will allow water to sit in the dimples. Hey, maybe that is why the other guys have you dry the sink after each use??? Just to give you some perspective, it takes one of our skilled workers an entire day to hammer a sink. I studied design for many years and lectured on upcoming trends. I believe I know what is trendy and what is not. Unique is not trendy, Quality is not trendy. Understated is not trendy. Our sinks are in no way trendy. We build less than 700 sinks a year. You can't start a trend with those numbers! "Me too" sinks get dated quickly. There are embossed designs on many of the inexpensive imports. That can only be accomplished by using very soft copper. A custom piece is timeless. Our Patineur, Lori Sabina, is a graduate of Purdue University's art school and has developed many unique patinated finish options for the aprons of our sinks that are exclusive to Rachiele. Our sinks are a "one of a kind" piece of commissioned artwork for your home. If you want an easy care sink that is a unique piece of art, Rachiele is the company. We have 16 years of experience in "hands-on" copper finishing. I may be one of the only owners of a copper sink company that actually sees the sinks in production and watches over every aspect of the finishing process on a daily basis. As far as embossed designs - not possible due to the hardness of the copper we use. 18 to 14 gauge - mostly recycled annealed (softer) copper. Annealed copper the type of copper most people are accustomed to seeing. It is very soft and will dent easily. This is a true story that happened back in 2017. I received a call from a lady who was obviously distressed. She said she was standing on a short stool and lost her balance and fell backward and caved the front of her apron sink in. She neglected to mention she did not purchase the sink from us. I was thinking... holy mackerel, how much does this lady weigh? I have stood on the apron of my sink at well over 200 lbs. Well, it was an import and sadly, I could not offer a solution. 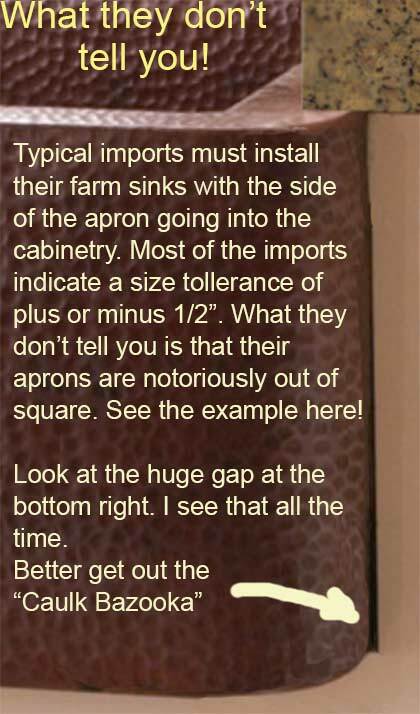 Another client told me that her neighbor purchased an import with a towel bar on the front of the apron farm sink. After a short time of leaning against the towel bar (a bad idea in the first place), the apron caved in. You can see me standing on the apron of one of our copper sinks in the next tab down. Very soft annealed recycled copper - easy to bend and dent. No other company (of any kind) guarantees you will be thrilled with the quality or your money back plus $100 for your inconvenience! In fact, I don't think any company anywhere is so convinced of the quality of their product. If you are not thrilled with the quality of our sink, we will buy it back, pay all shipping costs and send you a check for $100 in consideration of your inconvenience. We claim to build the finest copper sink in the world and we back that claim with the above guarantee! Imitation is flattering unless it fools the public. There is a company giving the impression they have sink design experience that copies so much of what we do that clients have asked if I own that company and offer my products at a discount on that website. They clearly do not have our skill-set in design or manufacturing ability. Just give me a call and I will explain the many design flaws in their sinks. Call me at 407-880-6903 to hear the real story. The following features and designs in my sinks were my original ideas. 1. Rear corner drains in all sinks. 2. Ergonomically correct sink designs. 3. Workstation sinks along with most of the accessories. I have to give credit where it is due. The mixing bowl, colander and small tray idea came from The Galley sink company. I simply improved on the ideas. The sponge caddy was my idea - copied (even by name) by the imitator company. Retrofit sink designs. Double tier sink design. I have over a dozen patents on my designs. We have well over 100 Five star reviews on Houzz.com. Some companies have actually faked some of the testimonials on Houzz.com. Sad to say, but I have proof. Just look at the hundreds of threads in the Gardenweb forum. You will never see a negative comment about my company. Wonder why they rarely show the bottoms of their sinks? Flimsy construction - that's why! The bottom of our apron is closed, so are the sides. The apron is so strong I can stand on it with no bending at all. I weigh 215 pounds! 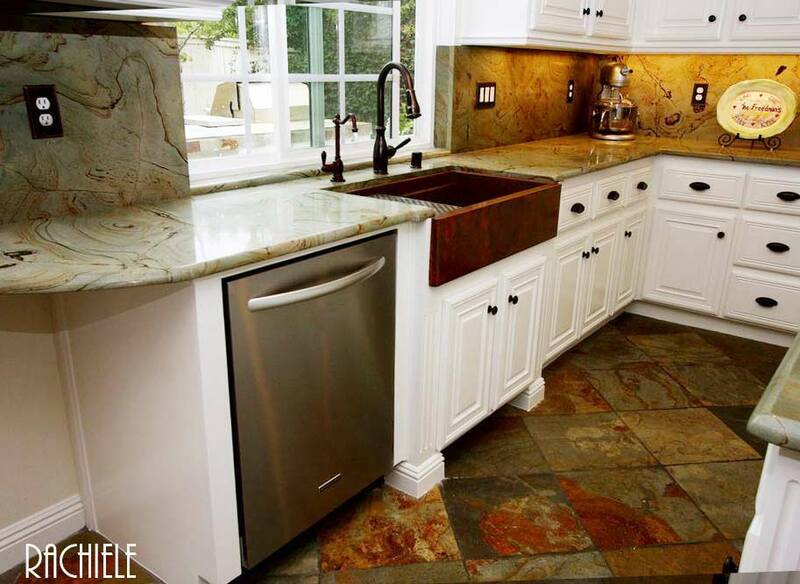 No copper sink on the market is built as strong. That is why we can offer a lifetime transferable warranty. Generally recycled - I have serious doubts any of the imports use electrolytically refined recycled copper. By the way, that is the ONLY way to remove impurities in recycled copper! The myth that recycled copper is somehow better for the environment in this case is simply not true in my opinion. Recycled copper, that is not electrolytically refined, has no place near food surfaces. Check out this video to see where some of the recycled copper comes from when imported. You might want to check if they go through the costly electrolytically refining process to purify the copper properly. This is another video you might want to see. I have seen how electrolytically refined copper is made. I have never seen it in bagged form. We use only virgin copper. The following is text from Copper.org website. "Where scrap copper is associated with other materials, for example after having been tinned or soldered, it will frequently be more economic to take advantage of such contamination than try to remove it by refining. Many specifications for gunmetals and bronzes require the presence of both tin and lead so this type of scrap is ideal feedstock. Normally it is remelted and cast to ingot of certified analysis before use in a foundry. Scrap of this type commands a lower price than uncontaminated copper." "Uncontaminated recycled process scrap and other scrap that has been electrolytically refined back to grade 'A' quality may also be used." The cost process of electrolytically refining copper to a quality high enough to be used in a residential sink is higher than mining and refining virgin copper. So if that is the case, do the math yourself. How are some of the imports so cheap? I regularly see copper sinks offered overseas for $200 plus shipping. Shipping is not that expensive, so a hard delivered cost of $300 for a copper apron front sink is pretty cheap. I pay more for the material I use. Copper prices are internationally similar if you are buying pure copper. So, if that is the case, is the recycled copper really being processed properly? If it is, then the folks selling it should provide hard written proof. Just melting down scrap copper and claiming 99% purity is not good enough from my perspective. When you order an import, your sink could vary significantly from the size you order! "They" tell you the reason is because they are hand made. Really? Since when does hand made mean poor quality? Our sinks are hand made and when you order a 36" sink it measures 36", not 35 1/2" or 36 1/2". We know how to use a tape measure here! 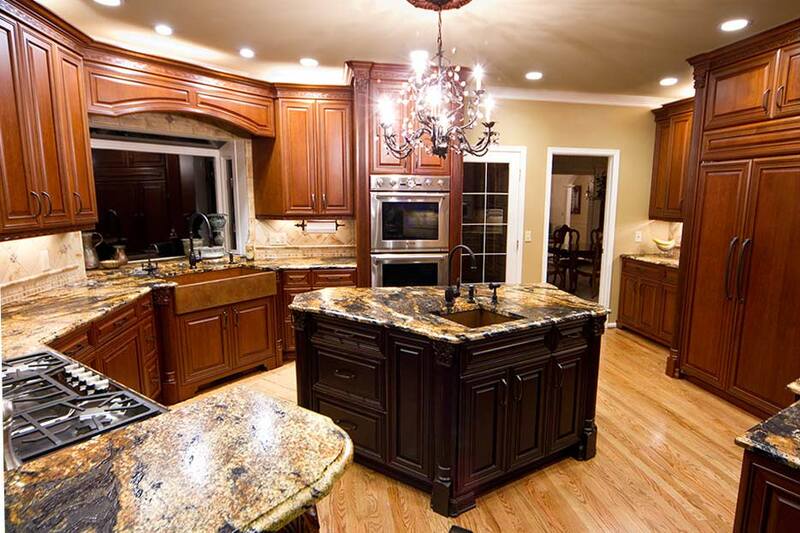 The other issue I saw was the sloppy granite cut out on the counter top. Traditionally, the best and cleanest installation is a flush one, where there is no granite overhanging the sink. 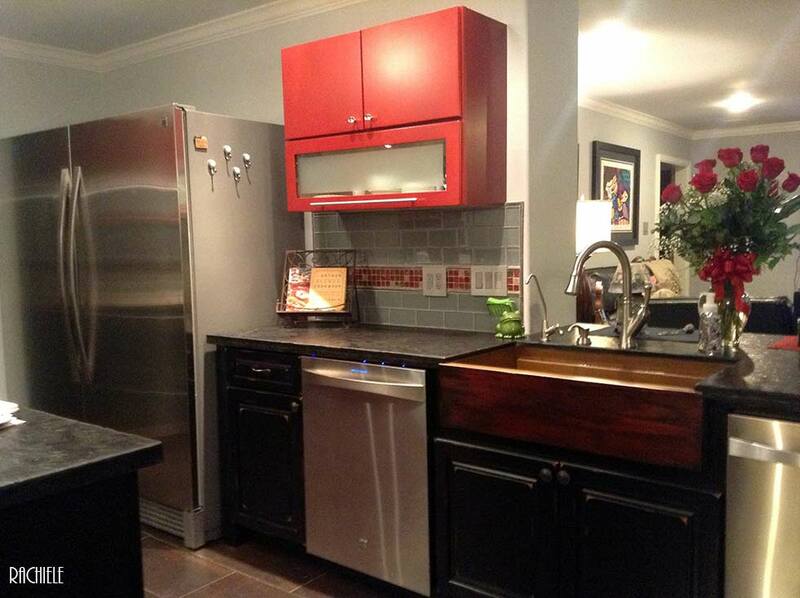 As you can see by this photo, the counter top shows over an inch of the sink showing. Can you imagine trying to get the water off that ledge? No wonder they advise you to dry the sink after each use. 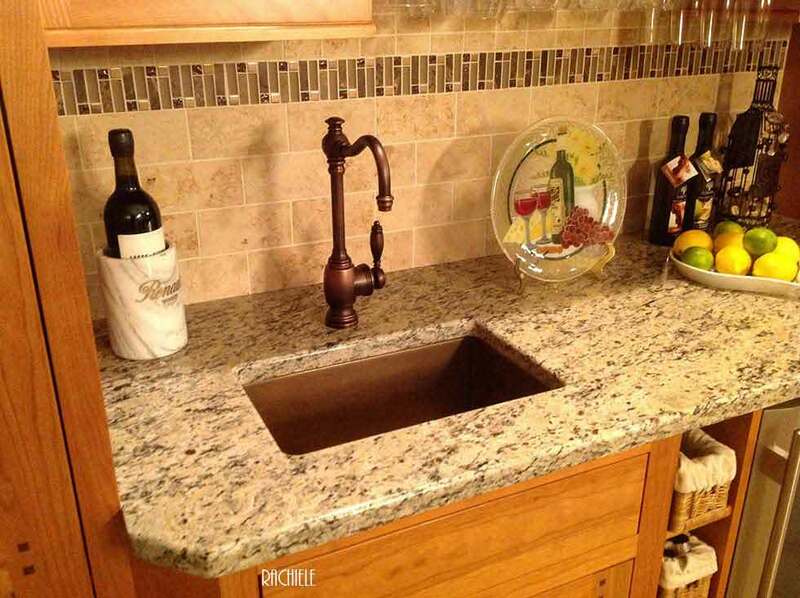 If you try to follow the shape of the sink with the granite, you will find it nearly impossible, as the sides of the sink are generally wavy and the corner radii are likely quite different. So, with most imports, you have to either have a generous overhang or the top of the sink must be exposed. Both options are far from optimal in terms of cleanliness. Our sinks are guaranteed to be true and square. When you order a 36" sink, it will measure 36", not 35 1/2" to 36 1/2" as indicated by most imports. (they say plus or minus 1/2"). Don't believe me? Go to the local showrooms with a tape measure or a square. See for yourself. Remember, my sinks come with a quality guarantee. If the quality is not up to your standards, I refund all of your money, pay all shipping and send you a check for $100 in consideration of your inconvenience. If, somehow, we built a sink out of square like the one in the photo, the sink would not even be sold on our clearance as a second. We would sell it as scrap. So... you have the choice of buying a caulk bazooka or investing in a sink that is built with quality. Read some unbiased comments about our sinks on a Web forum (Garden Web) by clicking the links below. Rachiele is everything you need to create an awesome kitchen! Buy Now! ï¿½ Copyright 2015. All Rights Reserved.